: Guard and watch dog. : Dmitry Mescheryakov, edited by Elena Krutsenko. Revised by Renée Sporre-Willes / Original version (EN). 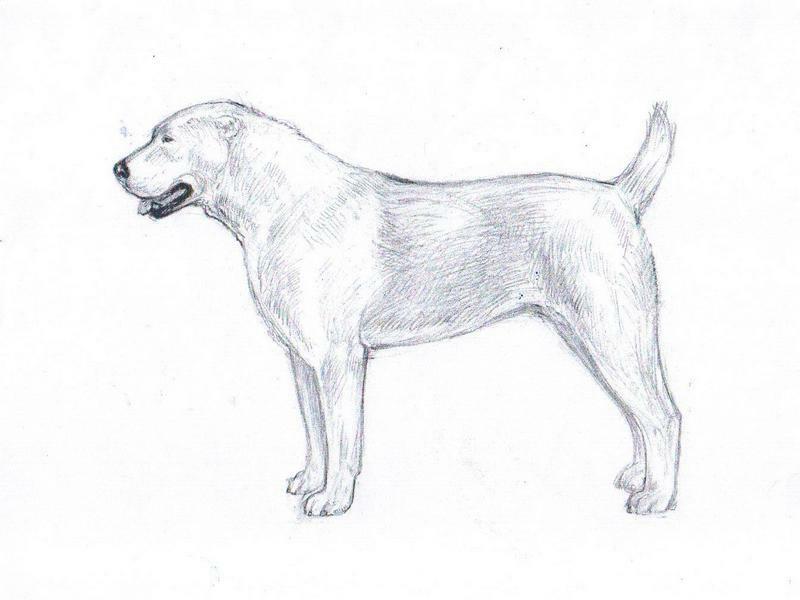 : Central Asia Shepherd Dog (CASD) is one of the most ancient breed of dogs. They were formed as a breed from natural selection during more than four thousand years in the vast territory, which spreads nowadays from the Caspian Sea to China and from Southern Ural to Afghanistan. Its heritage is from the most ancient dogs of Tibet, Cattle Dogs from various nomad tribes’ dogs that are closely related to the Mongolian Shepherd Dog and the Tibetan Mastiff. The CASD were mainly used to protect cattle, caravans and the owner’s dwellings, and being exposed to rigid natural selection. Hard living conditions and constant struggle against predators have had influence on the shape as well as the dog’s character and it has made it strong, fearless, and taught it to save its energy. 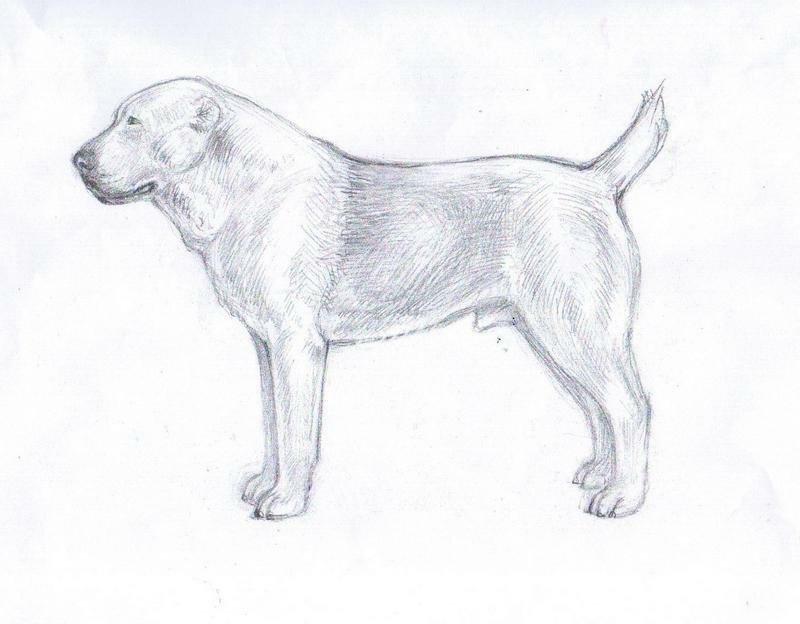 In the places of primordial habitation, the CASD were used mainly to protect herds from predators and also as guard dogs. : The Central Asian Shepherd Dog is of harmonious build and large stature, moderately long (neither long nor short in body). : The length of body only slightly exceeds the height at withers. Larger stature is desirable but proportional constitution must remain. Length of forelegs up to the elbow is 50-52 % of the height at the withers. The length of muzzle is less than 1/2 the length of head, but more than a 1/3. : Self assured, balanced quiet, proud and independent. The dogs are very courageous and have high working capacity, endurance and a natural instinct of territory. Fearlessness towards large predators is a characteristic feature. : Massive and in balance with general appearance. Head shape is close to rectangular, seen from above and side. : Deep in skull. The forehead is flat and the skull part is flat and long. Occiput is well defined but hardly visible, because of well developed muscles. Supraorbital ridges are moderately defined. : Stop is moderately defined. : Large, well developed but not exceeding the general contour of the muzzle. Colour of the nose is black but in white and fawn coloured dogs the nose can be lighter. : The muzzle is blunt and of moderate length, it is almost rectangular viewed from above and sides and narrowing very slightly towards the nose. Muzzle is voluminous, deep and well filled under the eyes. Bridge of muzzle is broad, straight and sometimes with a slight down face. Chin is well developed. : Thick, upper lips tightly covering the lower lips when the mouth is closed. Full black pigmentation is preferable. : The jaws are strong and broad. Teeth are large, white and close to each other, 42 in total. Incisors are set on a line. Scissors bite, pincer bite and also reversed scissors bite is accepted. Canines are set well apart. An injury to the teeth that does not affect the use of the bite is of no consequence. : The Cheekbones are long and well developed, without interfering with the rectangular shape of head. : Medium sized, with oval form, set well apart, looking straight ahead, and moderately deep set. The colour of the eyes from dark brown to hazel. The darker colour is preferable. The eyelids are thick and preferably with lower eye lid not too loose. No visible third eyelid. Fully pigmented eyes rims are preferred. Whatever the colour of coat, eye rims should be black. Expression is confident and dignified. : Medium sized, triangular shape, thick, low set and hanging. Lower part of ear base is level with, or slightly below the eyes. Traditional ear-cropping, in the fashion illustrated on the cover, is still practiced in country of origin and in countries where it is not prohibited by law. : The neck is of medium length, very powerful, oval at cross-section, well muscled, and low set. Dewlap is a specific breed feature. : Well proportioned and well sustained, and must keep typical topline in stance. : Well defined, especially in males, muscular, long and high, with well defined transition to the back. : Straight, broad, well muscled, the actual length is about ½ of the length from the withers to tail set. : Short, broad, muscled, slightly arched. : Moderately long, broad, well muscled, slightly sloping to tail set. The height at the withers exceeds the height over rump by 1-2 cm. : Deep, long, broad, distinctly developed, ribcage broadening towards the back. False ribs are long. Lower part of the chest is level with the elbow or slightly below. Fore chest extends slightly in front of the humerus/scapula joint. : Belly is moderately tucked up. : Thick at the base and set fairly high. The natural tail is carried in a sickle curve or curled in a loose ring that begins at the last third of the tail. When alert the tail rises to the line of back or slightly above. Hanging at rest. Traditional tail docking, in the fashion illustrated on the cover, is still practiced in country of origin and in countries where it is not prohibited by law. : Forelegs are straight with strong bone, seen from the front parallel and not close together. Seen from the side, the forearms are straight. : Shoulder blade long, well laid back, forming an angle with the upper arm about 100°. Well muscled. : Oblique, long, and strong. : Correctly fitting, turning neither in nor out. : Straight, very strong bone, long, oval cross-section. : Moderate length, broad, strong, upright pasterns. : Large, rounded, arching toes, pads are voluminous and thick; nails could be of any color. : Viewed from the rear straight and parallel, set a little wider than forequarters. : Broad, moderately long and strongly muscled. : Turning neither in nor out. The knee angulation is moderate. : Of almost the same length as upper thigh. : Very strong of moderate length, perpendicular. No dewclaws. : Well balanced and elastic. Trot with free reach in the forequarters and with powerful drive from the hindquarters. Top line is steady while moving. All joints to bend without effort. The angulations in hindquarters is more distinct when moving than in standing pose. : Thick, sufficiently elastic loose lying to prevent injuries if in combat with predators. : Abundant, straight coarse and with well developed undercoat. Hair on the head and on the front part of limbs is short and dense. Coat on withers is often longer. The guard coat can be short or slightly longer. Depending on the length of the outer coat there can be either shorter hair (3-5 cm), covering the whole body or with longer hair (7-10 cm) which forms a mane on the neck, feathers behind the ears and on the back parts of the limbs and on the tail. : Any, except genetic blue and genetic brown in any combination and black mantel on tan. 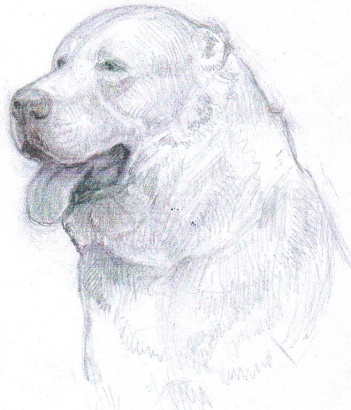 Slight deviations from the breed type. 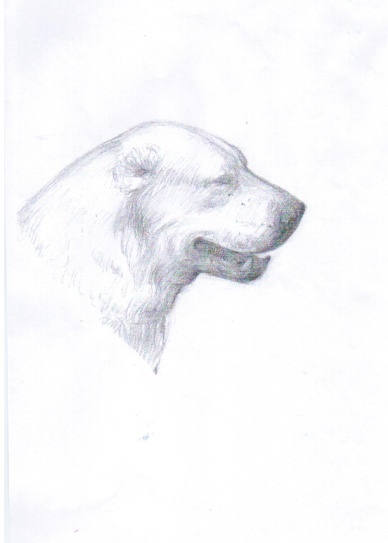 Rounded skull, narrow muzzle & narrow lower jaw, small nose. Eyes obliquely or close set, loose eyelids. Thin or loose hanging lips. High over the croup. Slightly short croup. Splayed feet and long toes. Hackney gait, slightly un-balanced movement. Significant deviation from required type and constitution. Leggy appearance; light in bone, soft muscles. Eyes too light or bulging eyes. Croup much higher than the withers. Narrow, short and steep croup. Natural stubbed tail, kinked tail. Pasterns too high, down in pastern. Hindquarters set too far under body. Height at withers 2 cm less than stated minimum. Overshot or distinctly undershot bite. Eyes of different colour, blue or green eyes; squint. Coat of any combination of genetic brown or genetic blue colour. Colour that is tan with distinctive black mantle. Coat that is curly or soft.